This waterfall is taller and more impressive in person. Roaring Fork is a unique cascade and indeed, it's aptly named. As it serpentines down 100 feet, it makes quite a lot of racket! It's one of the falls you often see on postcards from the area. 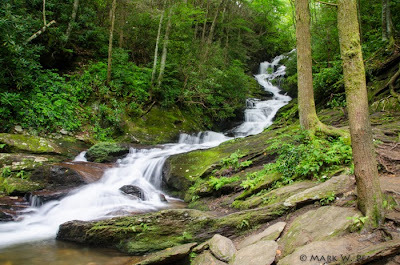 From the Tri-Cities in Tennessee (where I live), this waterfall is a bit of a drive, but there are lots of things to see and do in this area to make it worth the trip. 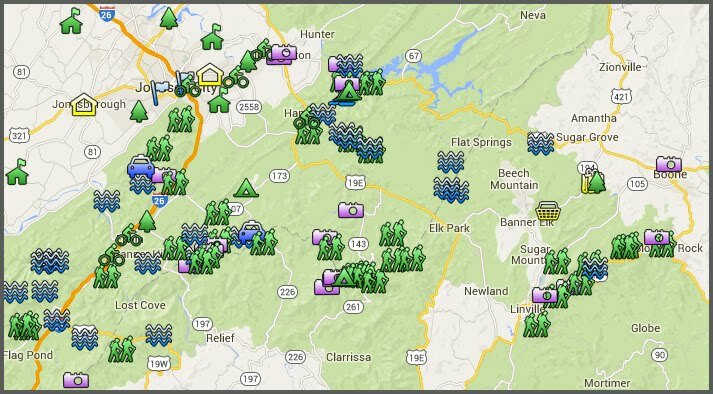 I really recommend this one if you're planning a visit to Mount Mitchell and Crabtree Falls. It's easy to find, an easy walk/hike in, and it's really a spectacular cascade. Also nearby is Setrock Creek Falls. Directions: From I-26...Take exit 9 in North Carolina (Burnsville/Spruce Pine) and head east toward Burnsville. Continue for approximately 21 miles on Route 19/19E. At Micaville, turn right on Route 80 and continue for approximately 15 miles, turn right on South Toe River Road. There is a small brown sign indicating FS472 (this is just before the town of Busick -- if you go past the Blue Ridge Parkway you've gone to far, turn around and go back 2.2 miles!). After turning onto South Toe River Road, you'll immediately cross a bridge, on the other side of the bridge, turn left onto FS 5520 towards the Busick Work Center for 0.2 miles. The parking area is on left outside of the work camp gate, the trail is on the right. Follow the trail (old gravel road) for approx. 2/3 mile (level, easy grade), immediately before crossing over Roaring Fork, turn right and follow trail for about 100 yards to the falls. Map here. This is a beautiful waterfall to visit and, yes, it is more impressive in person.